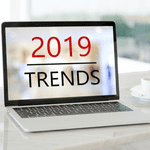 As we enter the last month of the year, the trends we’ve seen unfold over the previous months enable us to peer into the future and predict the most probable IT Trends in 2019. A multi-cloud strategy refers to when a company’s overall cloud infrastructure consists of one or more public clouds and/or private clouds. For example, that company might be subscribing to both AWS and Azure, while also maintaining a private cloud in its own data center. One of the major benefits of adopting a multi-cloud strategy is that your company becomes more immune to the headaches of vendor lock-in. It’s putting into practice the old adage, “Don’t put your eggs in one basket”. It also allows you to run your workload where they are most suited. If you’re planning a big data project but a particular cloud service provider (CSP) has better support for building a Hadoop cluster than your current one, you might be confused as to what to do. If you’ve embraced a multi-cloud strategy, the answer is simple—run your big data project on the second CSP, while keeping your existing workload where they are. Last year, IDC predicted that over 85% of enterprise IT organizations would commit to multi-cloud architectures by 2018. Based on interactions with our own customers, we believe multi-cloud adoption is going to accelerate even further in 2019. One of the fastest growing IT trends in 2019 is the workspace evolution. Last year, millennials were the largest working generation in the US, making up more than 35% of the total workforce. We expect that percentage to grow even bigger next year. This has profound implications on the evolution of workspaces, as millennials prefer non-traditional working environments. That’s why we’re seeing workspace architectures being incorporated with open spaces and hot desks. It’s also the reason we’re witnessing the rise of telecommuting and the emergence of coworking spaces. Millennials want their working environments to foster collaboration, openness, and flexibility. People born after 1996, commonly referred to as Gen Z or Centennials, have also started joining the workforce, with the same workplace preferences as millennials. In order to meet the working preferences of this younger workforce, companies have to adapt. Companies have to provide better support for interconnectivity and mobility, while also ensuring security and availability of corporate services and data. They want to make sure their employees stay productive regardless of where they work from. Some companies have already started implementing changes to their IT infrastructure, but we expect more to follow in 2019 as this new concept becomes the norm. One byproduct of the preference for non-traditional workspaces is the desire to work from anywhere. Many employees now wish to have the flexibility to work at home, in a coffee shop, or hotel lobby. Sometimes requiring the use of multiple devices to maintain their level of productivity. If a user starts working on a task on his office desktop computer but then decides to work someplace else, he should be able to work as he goes. While on board a taxi or a train, he might need to review or make some edits on his tablet or smartphone. Upon reaching a destination, he may want to continue on his laptop. Later still, he might want to shift to his home computer in order to take advantage of a larger screen or perhaps even multiple monitors. Theoretically, this is now possible with the use of cloud computing. However, if his office desktop computer is running on Windows 10, his company-issued phone is an Android, his company-issued laptop is again on Windows 10, and his home desktop is a Mac, then it’s likely that he will have to keep adjusting from one user interface to another. In 2019, we believe businesses will start adopting technologies that will enable a consistent user experience across different platforms. This will make it easier for users to resume work on a task even when shifting from one device to another. We believe these three IT trends are going to dominate 2019. What do you think will be the top IT trends in 2019? Let us know in the comments.